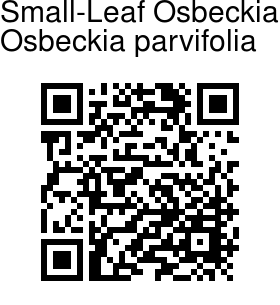 Small-Leaf Osbeckia is a prostrate to ascending herb. Stems are laxly hairy with purplish or brownish to yellowish spreading hairs. Leaves are elliptic, 1-6 x 0.8-3 cm, basally rounded to obtuse with a 1-6 mm long stalk, pointed at the tip, generally 3 or sometimes 5-nerved, rather densely velvet-hairy with long hairs on both sides. Flowers are few or several in rather loose clusters, stalked, 4-petalled or occasionally 5-petalled. Hypanthium is 2-4 mm wide, with a rather lax cover of purplish or brownish to yellowish long hairs. Sepals are triangular-ovate, 2-4 mm long, persistent in fruit. 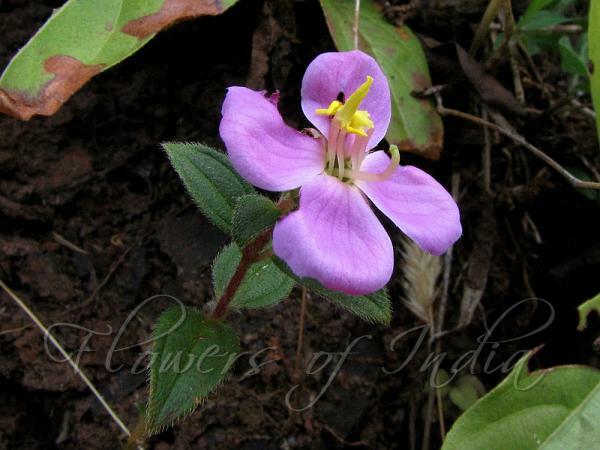 Petals are 5-11 mm long, pink to mauve. Anthers are ovate-oblong, obtuse, 2-4 mm long, not or only slightly twisted. Small-Leaf Osbeckia is found in South India and Sri Lanka.